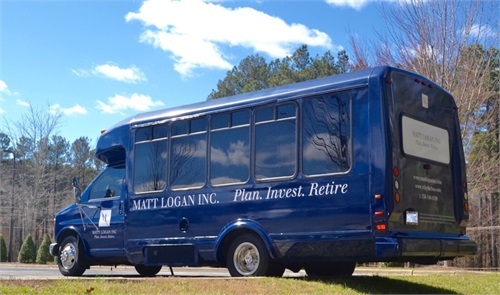 Why would a financial planner have a party bus? That is the first question anyone asks. “Because it is a fun way to give back to the community that supports us.” I respond. Sometimes a business does something so out of the ordinary it can’t help to draw attention. I have tried to find out of the ordinary ways to do business in a very traditional sector of the business world. I am a Certified Financial Planneräbased out of Greensboro, North Carolina. In a world where the average age of a financial advisor is 50.9 and aging, I am only 36. In a world of seminars and cold calls, my business grows through word of mouth, professional referrals and believe it or not, social media. My hope is that my entrepreneurial spirit can be felt by everyone who enters my office on North Elm Street. The idea for the bus came from a frustration with finding a way to participate in various non profit auctions. I refused to offer a “Free Financial Plan” like others in my space as I felt that was not genuine. One night, while brainstorming business ideas with my wife over a glass of wine the idea of the party bus was born. The first year the bus was used was 2015. I purchased the bus on Craigslist in late 2014 and did a number of improvements to get the bus into better shape. I painted it and added branding and the bus was ready. The final thing was coming up for a name. After more brainstorming with my wife Evan, we finally came up with “Why The Bus” and even assigned the website whythebus.com as a way to brand the idea. It kind of became his hobby as I befriended some guys who work on the local school buses. I learned how to install LED lights, fix a door and wire televisions. It was a fun way to not be so focused on work all the time as is natural for many owners of small businesses. I found a driver named Mike who has really helped make everything work. A former professional bowler who drives a school bus, Mike can’t be missed with his knee length dreadlocks. Mike tells me that he can’t go anywhere without people recognizing him as the bus driver now. In 2015 alone, the bus raised over $6000 for various non profits. Hospice, Triad Local First, local schools and preschools, the Science Center, medical research, the Junior League, Rotary, the Guilford Green Foundation all have benefited from the bus through their various fundraising efforts. I consider this a huge success to support such a variety of different organizations in a unique way. In my opinion, one of the best uses for the bus in it’s first year was to take homeless men and women from downtown to various churches for a warm Thanksgiving meal. The bus was also used for various sporting events, concerts, and even his two daughters’ birthday parties. There are not a lot of things more fun than having 14 six-year-olds singing Kids Bop at the top of their lungs on the back of a bus. The bus fits two principals that I have created his business around. The first is fun. I think that if I am not having fun with what I am doing every day, I am not doing the right things and need to make a change. The bus has been a fun and odd way to be creative. The second is giving back to the community that has done so much for me. I love Greensboro and the strong philanthropic spirit that it fosters and I want to be part of it. So has the bus resulted in new business for me? If I look at it overall, I don’t think it has paid off in terms of business but that is not my only objective. It has definitely created awareness of my firm throughout the community and that is great. The real reason for the bus is to have fun and help raise some money and that has been accomplished and continues to see results. As long as I am having fun and seeing results locally, the business will follow, either directly or indirectly over time. I have another 30 years to do this, so I am not in any rush.